I absolutely love cheesecake. It's rich, it's creamy, and it's super satisfying. 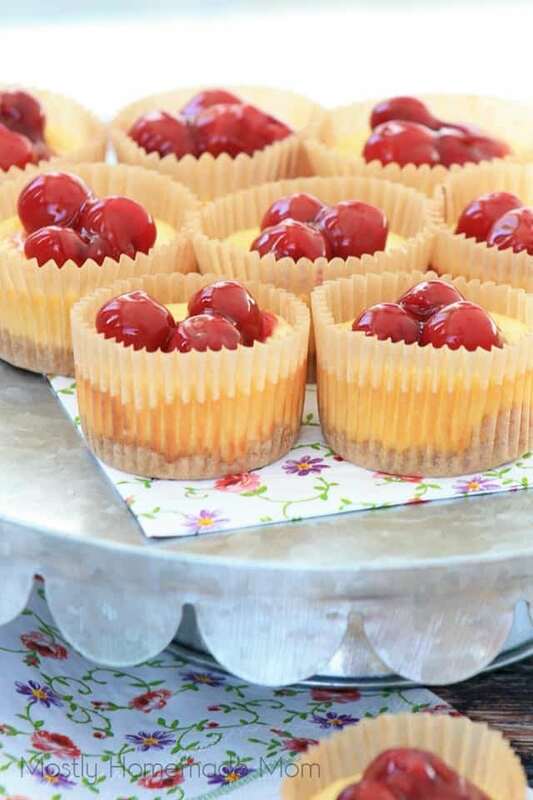 But, there's something about mini cheesecakes that really stand out. Of course, they look adorable, but you can easily make so many different flavors, which gives you an excuse to try every single one. Bite size mini cheesecakes are perfect for a bridal shower, holiday party, or any other special occasion and you'll love seeing your favorite cheesecake flavors in a smaller form. Grab your mini cheesecake pan or muffin tin and start mixing up some cheesecake. New York style cheesecake is popular for so many reasons- it's denser than regular cheesecake, a little tangy, and smooth. The graham cracker crumbs are mixed with melted butter and pressed into a mini muffin pan. The cheesecake batter is rich and made with cream cheese, sour cream, granulated sugar, lemon juice, eggs, and vanilla extract. Make sure to remove the cupcake liners before serving with fresh fruit. This mini cheesecake recipe is pretty similar to the one above, but it's not as dense as NY cheesecake. Beat cream cheese, sugar, large eggs, and vanilla extract with a hand mixer and pour the batter over the graham cracker crust. You can even try swapping out the graham crackers for vanilla wafers. Fresh fruit works for the topping, but we recommend using cherry pie filling. I'm a little obsessed with cookies 'n cream desserts, so this mini cheesecake recipe is on my to-do list this week. The serving size is small and the recipe calls for low-fat cream cheese, so no need to worry about eating a few of these beauties! What could be better than a no-bake cheesecake recipe? These little cheesecakes can be made with even turning the oven on. The cheesecake filling is a little tart from the lemon juice but balanced out by the sweetness in the graham cracker crust. Refreshing and delicious. Decadent and sweet, these peanut butter mini cheesecakes will be all the talk at the party. And peanut butter and chocolate happen to be one of the best flavor combinations ever! Tip: if you don't have time to make the chocolate whipped cream, just drizzle some melted chocolate over the top instead. Here's the recipe. No water bath needed for this recipe. Press the chocolate crumbs into a mini cheesecake pan or muffin pan and top with the chocolate, sour cream cheesecake filling. Tip: let the cream cheese sit out at room temperature for at least 30 minutes so it's easier to soften with the stand mixer. If you're a fan of turtle candies and the flavors- caramel, melted chocolate, and pecans, you'll love it as toppings for these mini cheesecakes. Start by combining the graham crackers, melted unsalted butter, and granulated sugar in a mixing bowl and press the crust into a muffin tin. Pour over the cream cheese mixture, bake, and top each one. You might have to whip up a double batch! The gorgeous pink color in these cheesecakes comes from the fresh raspberry purée and will easily brighten up and add elegance to the dessert table. You'll never hear me complain about candied bacon on top of creamy cheesecake! Don't forget to save some of the bacon drippings to add into the chocolate or vanilla wafer crust. Go ahead and add a little booze to this dreamy filling! What's not to love? You can also make these little cheesecakes gluten-free by swapping out the regular flour for a gluten-free flour mix. The combination of orange zest and whipped cream in this cheesecake recipe really makes you feel like you're a kid again cooling off with a creamsicle popsicle. Although, I do love the addition of Grand Marnier in this recipe. Tip: using brown sugar instead of granulated sugar adds a deeper flavor to the graham cracker crust. Watch: How to Restore a Cast Iron Skillet in 5 Steps.